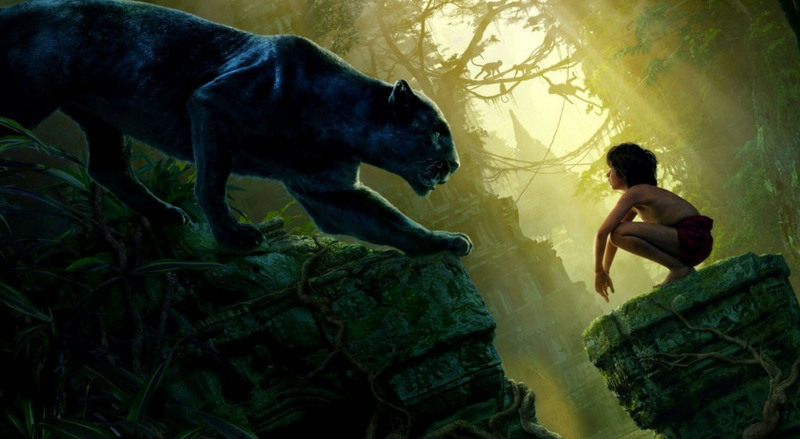 The Jungle Book, a familiar real world of greens and very attractive spaces of the natural wilds, and Avatar, an imaginary futuristic Na’vi world of blues and seemingly an abyss of unfamiliar space, were both recommended by a close friend and well-wisher at different times a couple of years ago. 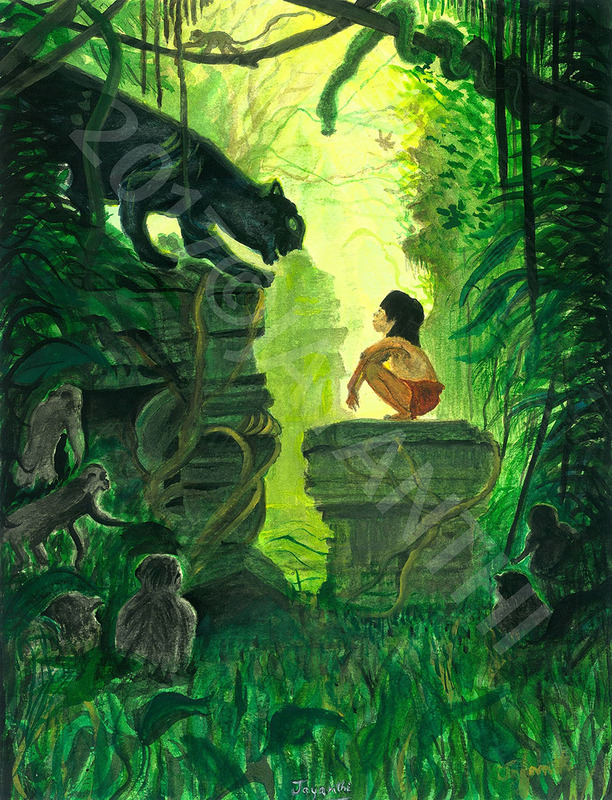 One day, about a year back, my younger son started watching The Jungle Book with me at home. Pulling up the chair reluctantly, he said, “Let’s watch it then,” as if he was doing me a favor. The art of playing with light to create suitable emotions, as seen in several black and white movies, such as Spielberg’s Schindler’s list, Ray’s Aparajito, Pather Panchali, and Charulatha, was happening with colors here. And with colors, I found it to be much more engaging, that I didn’t feel like I was watching a remake. I found the screenplay, dialogues, and quotes, adapted from Rudyard Kipling’s writing, to be sharp and profound. “What’s so special about this that you need to focus so much, Ma?” he laughed. Within ten minutes, he sneaked out. I was happy to be left alone to watch the rest of the movie. The cinematography swooped me up and left a lasting impact on me. Wash: A Cadmium Yellow with a fair quantity of pigments for the first wash, Sap Green and Burnt Sienna for subsequent washes. Several other colors were used for the details. Flash forward to a family reunion at my brother’s place in Chennai: my sister, who had insisted I watch Avatar, had a copy of the movie on her laptop. She decided to watch it. “Athai, you really haven’t watched Avatar yet?” my 12 year old niece asked me for the second time that day, wide-eyed with surprise. I had to tell her again that I was the only one in the family who had not watched it. She looked at me as if she was looking at a Na’vi. We watched the movie reclining on the bed, conversations floating around us, and the movie paused frequently as others attended to their ringing phones. I was overwhelmingly impressed by the level of imagination, the characterization, their appearances, and their world which so strange to humans. 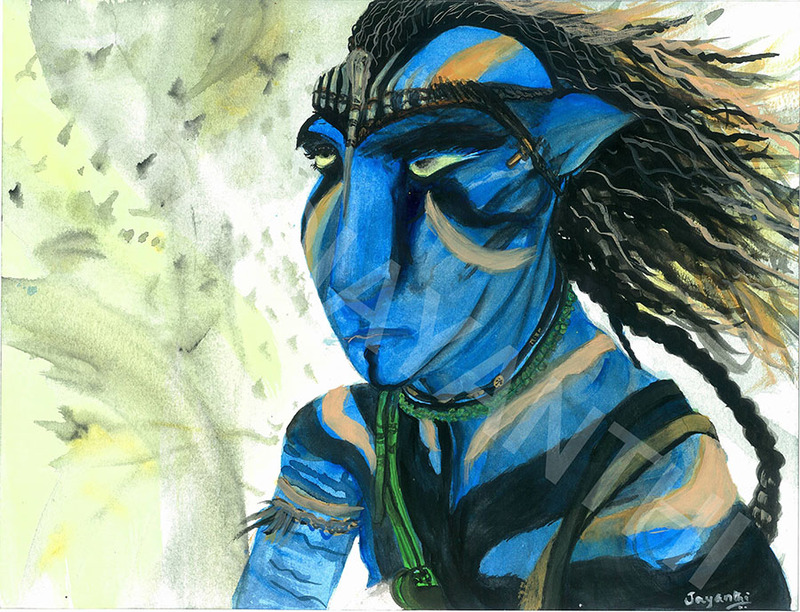 When I came to know later that James Cameron had actually sketched the characters and the space he saw in his dream, before he conceptualized and subsequently wrote the movie, I was intrigued by two things – to what extent a dream can possibly impact the dreamer, and how creatively he had translated the dream into writing and filming a movie. Just as an impressionistic abstract form of art or a thematic collage of film(s)can be quite expressive in its own way, I thought that a realistic re-creation of scenes could be my way of paying respect/tribute to the directors, and especially the cinematographers. Translating the ‘light’ from the language of a camera, one of the primary characters in the visual medium, into paint through brushes, needless to say, posed a challenge. It was what I wanted. That, and the experience I would derive out of it for my inner self, as well as for my skills. Interestingly, after having decided on the two images that I would recreate, I was childishly happy noting a common factor: Coexistence against all odds, that has always been an ongoing and endless endeavor, the cornerstone against which the universe continues to function. However, we realize that human greed penetrates not just the wilderness in earthly realms, but also infiltrates a distant moon. Washes: Dilute Yellow Ochre for background and a dilute Cobalt Blue for the subject for the first washes, Prussian Blue and Lamp Black for subsequent washes. Several other colors were used for the details. 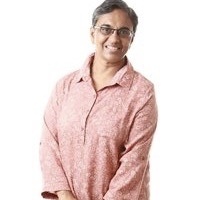 Jayanthi Sankar, born and brought up in India, living in Singapore since 1990, has been creatively active for the past twenty two years. Her work has been published in several magazines including Indian Ruminations, Muse India, The Wagon, inOpinion. Read Singapore, her short story was published in the quarterly magazine Ceriph – Issue 2. It was translated and included in the Russian anthology: To Go to S’pore, Contemporary writing from Singapore, Edited by Kirill Cherbitski. Another of her short stories, My mother is a feminist, was included in the anthology The Other. Starting off with pencils and charcoals, she has been teaching herself sketching, drawing, and painting for the past 11 months. As of now, her interest lies mostly in watercolors; exploring subjects like nature, still life, architecture. All images belong to the author. They may not be reproduced without permission.